The video, which will be available online, explores five critical resources—food, water, energy, land, and materials—and how each is affected by the global pressures of climate change, population growth, and human consumption. A series of excellent articles by W. Cecil Steward  in previous issues of Prairie Fire  provide an in-depth examination of the five critical resources. Steward is president of the Joslyn Institute for Sustainable Communities, which produced the video with several partners. This article will focus on the importance of education and conversation as we confront the global pressures identified in the video. Our planet doesn’t care about nationalities or political affiliations. While we argue and fight, or while we distract ourselves with sports or celebrities or shopping, there are rumblings in the earth. It is telling us things, but a lot of us aren’t listening. Thirteen of the fourteen hottest years on record have all occurred since 2000. Bird migration patterns are shifting, southern animals are moving northward. Northern animals, like the polar bear or arctic fox, have nowhere to go. Projected growth in yields in America’s corn belt could drop 25 percent by 2050 due to higher temperatures and other factors, and it is entirely possible that climate disruptions will lead to an eventual cessation of corn production in the Cornhusker State. On a global scale, the ongoing collapse of a large section of the Antarctic ice sheet is posing a more immediate threat to the world’s food supply, as arable land—especially in Asia—will be lost to rising seas. According to Nebraska Nexus, the 1.8 acres of land in production today per person worldwide is projected to diminish by 60 percent while demand for food will double. As alarming as this may seem, as a species we have difficulty maintaining a consistent discourse about topics vital to our survival. A warming planet doesn’t mean you can discard your woolens. What it does mean is that your need for them is becoming more unpredictable, and when the weather does change, it will be more abrupt and extreme than in the past. Whether you live in Nebraska or Timbuktu, we all live on the same earth and are all subject to its forces. And whether you think climate change is man-made, or partly man-made, it seems that whatever we can do right now to mitigate our output of carbon, it’s bound to help. By doing this we learn to work together toward a goal, and if we can do that, then we can also work together in finding ways to adapt to a world that is changing. Along the way we will also learn more about each other and the planet we share, and perhaps develop new habits of living that are more in sync with our environment. Brown says that 123 years later, in 1927, we hit two billion. Then just thirty-three years later, 1960, we reached three billion. Then the pace accelerated as we added another billion roughly every thirteen years. By late 2011 we were at seven billion, and most projections show us reaching 9.3 billion by 2050, with much of this population concentrated in cities. According to Nebraska Nexus, in 1950 there were only two megacities (populations exceeding ten million)—New York City and Tokyo. By 2025 there will be a total of thirty-seven megacities. To many of us, population growth is a double-edged sword. When our cities grow, we see it as a sign of a healthy economy. Exciting new services and attractions pop up. Property values increase. More jobs become available. But then we also see more traffic, and our commute times grow longer. Once-abundant water and energy supplies begin to run low and grow more costly, and both our air and water quality suffer. And although the urban dweller doesn’t see it, much of the growth has come at the expense of rural communities, where depopulation puts many towns on the brink of insolvency and even extinction. Depopulation isn’t the only effect our cities have on rural communities. The people may leave, but the resources on which they depend—food, water, and energy—don’t come with them. Of those three resources, water is a good indicator of the pressures of population growth because it is so vital to the production of food, energy, and materials. When one considers the growing worldwide demand for water, the connection between rural Nebraska, its towns and cities, and the world’s megacities becomes clear. As Nebraska Nexus notes, “where there are cities, there is great demand. This demand knows no boundaries; it has critical bearing upon our state’s natural resources, its agriculture, and its people.” Sitting atop one of the world’s largest freshwater aquifers, Nebraska must be ready to face these pressures. On a positive note, water-rich Nebraska has taken some important steps to secure its water future. In 1996 the state finally recognized the link between groundwater and surface water, an important first step in comprehensive water management. In April, Governor Dave Heineman signed landmark water management legislation that, among other things, retools the Natural Resources Commission, which will oversee ongoing state funding for water projects. So far the trend line is not in our favor. Conservative estimates of current consumption habits suggest that we have already gone over the brink: it now takes the earth one year and six months to regenerate what we use in a year. By 2050 it is projected that humanity will require the equivalent of 5.3 earths to provide the resources we use. It is instructive to go back to the early days of European settlement on the prairies. It was not a place for short-term thinkers, who wouldn’t last a season in the harsh and unpredictable climate. The successful settlers learned how to live with the land, with its bounties and limitations. What Nebraska has done is laudable, but a truly successful water management system—and indeed a plan that manages all resources in a sustainable fashion—will need an ongoing commitment from leaders and citizens who are engaged in the issues and in the environment on which they depend for life. Nebraska Nexus is good start. Living in a hotter, more crowded world means that we are going to have to develop new habits for living. We need to find a way to get back to the basics that made Nebraska “The Good Life” in the first place. Yet we continue to consume nonrenewable resources at alarming rates, behaving as though the end will never come and the earth has an unlimited capacity to absorb our wastes. We are playing a dangerous game of Survivor, and if we don’t change our tactics, we are all going to get voted off the planet. The problems are not insurmountable, with the largest and most challenging obstacle being ourselves and the bad habits we have developed, particularly since World War II when our car-based, consumer-oriented, live-for-today, throw-away society went into hyper drive. Somewhere in this madness of consumption we lost meaningful connections within generations, family units, and our communities. More and more we measured quality of life by our acquisitions—cars, TVs, refrigerators—as we measured our national worth in terms of car production and housing starts. Steward has long been a tireless advocate for sustainability, with Nebraska Nexus representing his latest efforts at promoting a statewide conversation on conservation. It is his hope that Nebraska might ultimately end up with a constitutional revision with a section on conservation. The example of the workshop participants featured in Nebraska Nexus can give us hope, and a sense of purpose, because they show us that solutions don’t come from a few experts. Every one of us has a role to play in a more sustainable future, and we can begin by becoming more aware of our surroundings, the issues we face, and our interconnections with nature and our fellows. Writer’s Note: Between August 2010 and August 2011, the Joslyn Institute for Sustainable Communities staged four community conversation conferences on “Nebraska’s Environment and Sustainability (CCNES).” With the assistance and partnership of Creighton University, the University of Nebraska-Lincoln, Central Community College, and Western Community College, the conference venues were Omaha, Lincoln, Grand Island, and Scottsbluff. More than six hundred Nebraskans participated in the CCNES, either in personal conversations at the four sites or in the online pre-event and post-event electronic conversations. The Nebraska Nexus video was produced by the Joslyn Institute for Sustainable Communities with the support of Humanities Nebraska and the Nebraska Environmental Trust, with the administrative support of Nebraska Academy of Sciences. 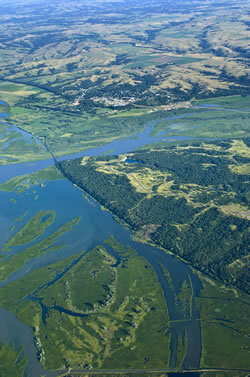 Nebraska Nexus: Resources, Conservation, Development and Change  from zigzag design  on Vimeo . For more information, visit the Joslyn Institute for Sustainable Communities’ website at www.ecospheres.com .